1. Habit. 2. Transverse section of thallus. 3. Upper subtidal (Nhatrang Bay, Vietnam).. 09 Mar 2012. Eduard and Tamara Titlyanova. © Eduard and Tamara Titlyanova (etitlyanov@mail.ru). Rottnest Island, Western Australia, Australia; subtidal. John Huisman. © John Huisman (j.huisman@murdoch.edu.au). Published in: Sonder, O.G. (1871). Die Algen des tropischen Australiens. Abhandlungen aus dem Gebiete der Naturwissenschaften herausgegeben von dem Naturwissenschaftlichen Verein in Hamburg 5(2): 33-74, pls I-VI. 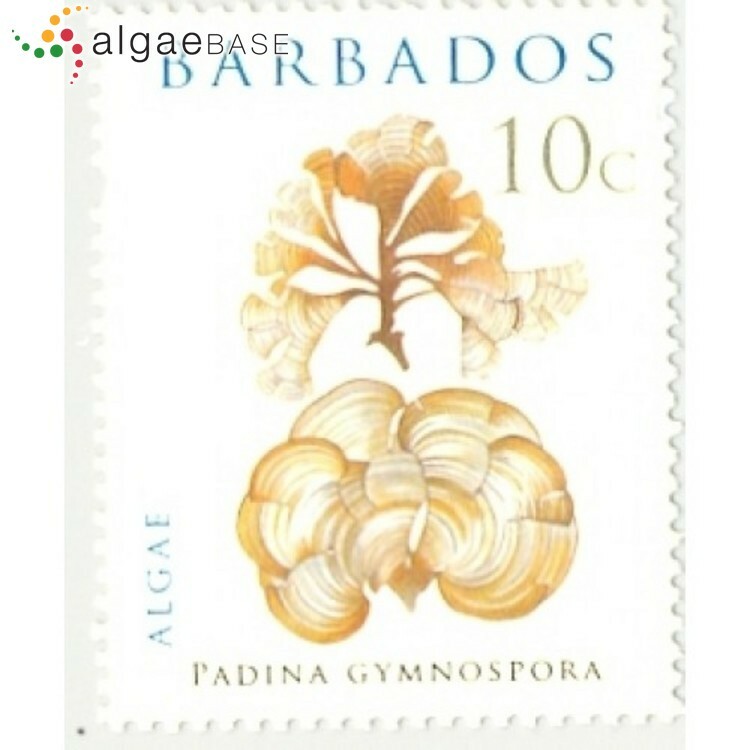 The type species (holotype) of the genus Padina is Padina pavonica (Linnaeus) Thivy. Type locality: "St. Thomas" (Herb. Sonder) [St Thomas, Virgin Islands] (Billard 1985: 29). Type: MEL 583380 (Womersley 1987: 217). 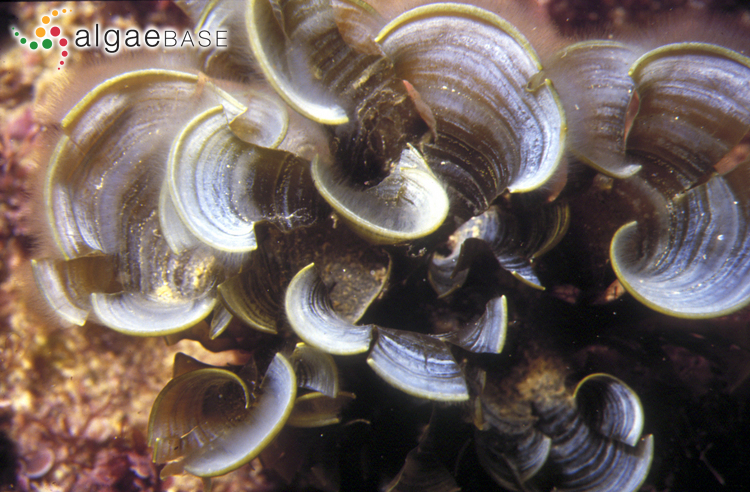 Børgesen (1941: 48) cites this species as Padina gymnospora (Kützing) Vickers. John et al. (2004) cite Padina howeana Børgesen and Padina variegata (J.V. Lamour.) Hauck. as synonyms of this species. Abbas, A. & Shameel, M. (2013). Morpho-anatomical studies on the genus Padina (Dictyotales, Phaeophycota) from the Coast of Karachi, Pakistan. Proceedings of the Pakistan Academy of Sciences 50(1): 21-36, 34 figs. Accesses: This record has been accessed by users 12302 times since it was created. Amado Filho, G. M., Karez, C. S., Pfeiffer, W. C., Yoneshigue-Valentin, Y. & Farina, M. (1996). Accumulation, effects on growth, and localization of zinc in Padina gymnospora (Dictyotales, Phaeophyceae). Proceedings of the International Seaweed Symposium 15: 451-456. Carvalho, R.T., Rocha, G.M., Paradas, W.C., Soares, A.R., Guarino, G.A., Passos, R.M.F., Filho, G.M.A., Farina, M. & Salgado, L.T. (2017). Cell wall physiochemical properties determine the thallus biomineralization pattern of Padina gymnospora (Phaeophyceae). Journal of Phycology 53(6): 1294-1304.
de Andrade, M.R., Farina, M. & Amado Filho, G.M. (2002). 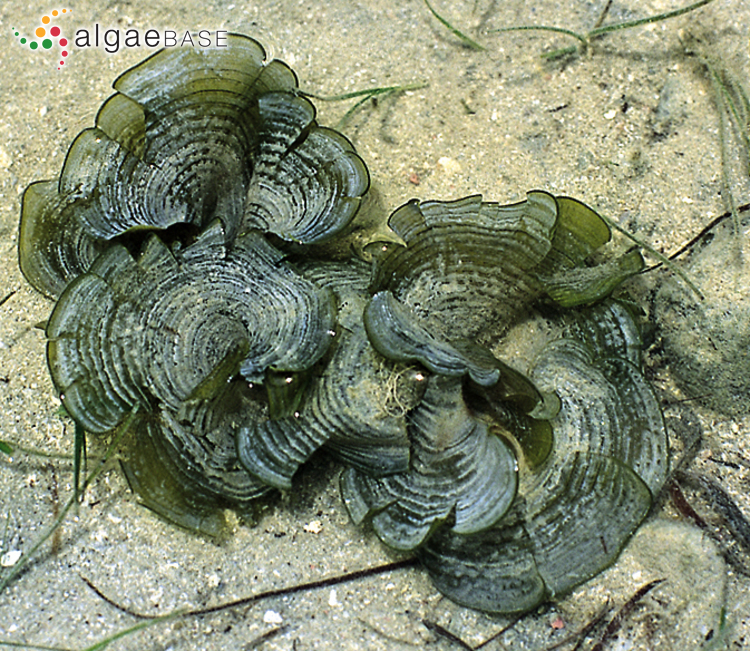 Role of Padina gymnospora (Dictyotales, Phaeophyceae) call walls in Cadmium accumulation. Phycologia 41: 39-48.
de Széchy, M.T.M. & Nasser, C.A.G. (1989). Aspectos fenológicos de Padina gymnospora (Kuetzing) Sonder (Dictyotales, Phaeophyta). I - Nota preliminar. Insula 19(Suppl. ): 51-70. Karez, C.S. & Pereira, R.C. (1995). Metal contents of polyphenolic fractions extracted from the brown alga Padina gymnospora. Botanica Marina 38: 151-155, 1 figs, 1 table. Mshigeni, K.E. & Mkwizu, K.J.K. (1977). Spore germination and early development in Padina gymnospora. Journal of Phycology 13 (suppl. ): 47. Mshigeni, K.E. & Mkwizu, K.J.K. (1978). 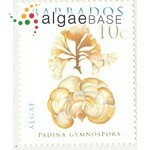 Contributions to the embryology of Padina gymnospora (Phaeophyta, Dictyotales). Botanica Marina 21: 331-336, 9 figs. Shanmuganathan, B. & Devi, K.P. (2016). Evaluation of the nutritional profile and antioxidant and anti-cholinesterase activities of Padina gymnospora (Phaeophyceae). European Journal of Phycology 51(4): 482-490. Thivy, F. (1959). 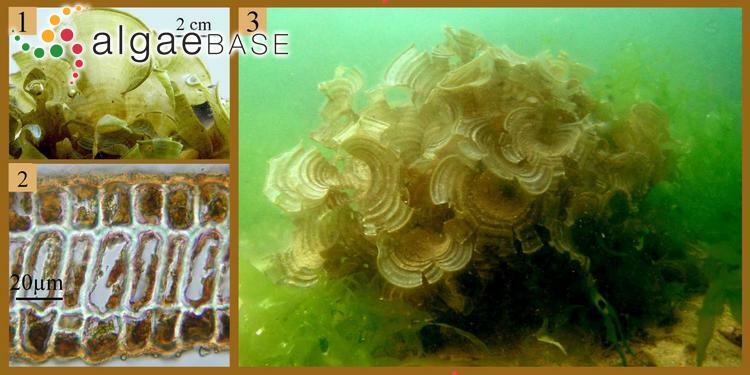 On the morphology of the gametophytic generation of Padina gymnospora (Kuetz.) Vickers. Journal of the Marine Biological Association of India 1: 69-76, 16 figs.